Another long day at Georgetown University Hospital, but on the whole an encouraging day for sure. The day starts with an 8:30 am appointment with my doctor to monitor my progress and to draw some blood to check if my levels are healthy enough for chemotherapy. At around 10:00 amwe head over to the Infusion Center to check in to get the medicine. Allison, the nurse, hooks me up to a hydration bag for the first couple of hours and then progress through premeds, including anti-nausea meds. This is followed by three types of Chemo and finishes with another hydration bag. The total time to take in all the meds can be 6-8 hours. What was encouraging is that Doctor Gioconne has found that the mass in my chest has shrunk and that the first couple of treatments are progressing. In addition my lymph nodes looked much better, and my blood counts are solidly in the normal ranges. By no means is this a victory in total, but it is a victory today. The bigger victory has come from the amazing people that have been continuing to show massive support. I’m so humbled by people who send notes, emails, Facebook messages, texts, and or visit in person. I’m not always in the best state to show my gratitude at those moments but they do mean so much. I want to thank my family for hanging out with me yesterday. Just the banter and conversation makes the day feel normal even as un-normal as it is. I love them so much and they provide so much joy. 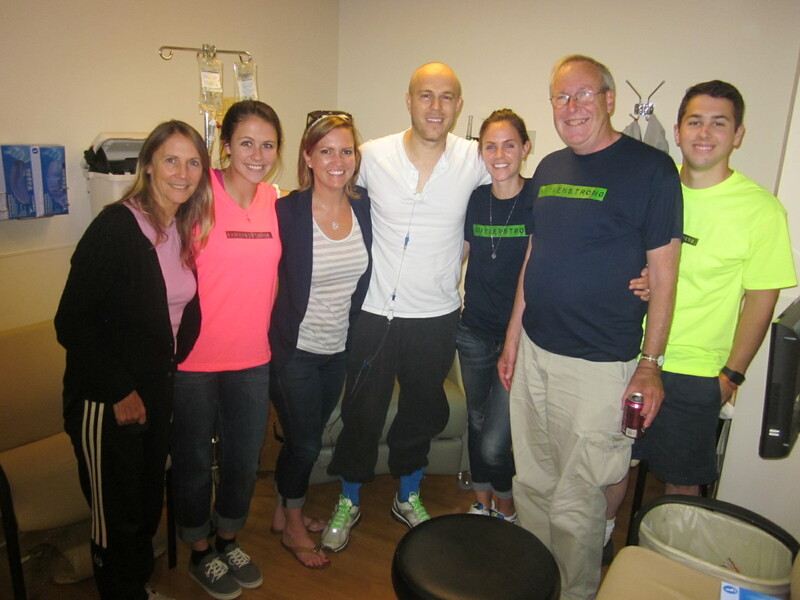 There were also some great friends who stopped by… The mere thought of wanting to stop by to say “hello” means so much. Praise God for blessing each day. There is no doubt that God asks us to lay our burdens before Him. I want to thank Him for this encouraging day. I want to thank you all for reaching out to God on my behalf. Post Script – Allison my nurse has been extremely helpful. She has been serving with a gracious heart. I pray for you every day. We haven’t met. Found you through Elizabeth and Kristin Foss (whom I’ve never met either!). Received our shirt last week. Now looking for a day when my whole gang is together so we can take a photo! Praying for you Shawn. Even though I don’t know you either, I’ve known Mike and Elizabeth Foss since we were kids, and have been following their postings on the various social media sites. You have an amazing attitude and are a wonderful servant of God. May He continue to fill you with strength as He lays His healing hands on you. God Bless You Shawn. amazing news!! So happy for you … like you said, God is good!!! We are praying and rooting for you! See you on Thursday at the juggle-a-thon! God bless you!